Welcome to End of The Road Kennels where "Best In Home" is as important to us as "Best In Show". Our experience and a long successful track record are something we are very proud of. In the early 80's I owned Rottweillers. During this time, Dog World Magazine had started introducing rare dog breeds, and in the February 1984 issue, I read about the Dogue De Bordeaux for the first time. By the mid 80's, I was interested in finding a suitable working breed, and the rare Molossers piqued my curiosity. I started researching and going to rare breed dog shows throughout the US. My goal was to learn everything I could about the temperament of the different Molossers, and decide which one was right for me. The show that stands out in my mind, was a show in New Jersey, in 1986. It was hosted by a man named Tobin Jackson. I saw the first pair of Tosas that had been brought into the United States at this show, as well as a pair of Cane Corsos that had been imported from Italy. This was a fairly big dog show, with entries including Dogue De Bordeaux, Argentine Dogos, and the American Bulldog. 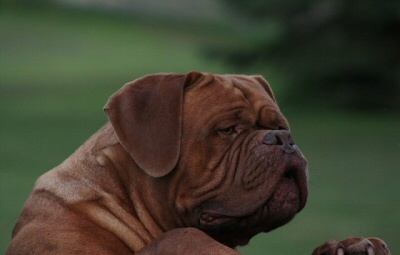 But, the dog that really caught my eye, was a male Dogue De Bordeaux named Cajun. He was owned by Steve Norris of Norris Place. I guess you could say, this is when I became infatuated with the Dogue De Bordeaux. Not long after the show, I acquired my first Dogue. Less than a year later, I had her spayed because of poor hips. In July of 1988, the Dogue De Bordeaux was featured on the front cover of Dog World Magazine. This was my first introduction to TNT Kennels, and it's owner, Pete Curley. Less than 2 months later, I spent the money I had saved for a down payment on a house to purchase two French Imports through Pete. It was only a short time later that I imported 3 more Dogues, one from France, one from Germany, and one from Spain. The Dogue De Bordeaux being brought into the country at that time were massive, and they portrayed their true temperament and type. However, many were not very "athletic". This is when I made it my goal to preserve the original temperament and type while striving to improve the health of the Dogue De Bordeaux.